Propane provides a reliable fuel source for homes where natural gas is unavailable, powering heaters, hot water tanks and cooking appliances. Although propane is the least flammable among typical residential fuel sources, not lighting until the air temperature reaches 940 degrees Fahrenheit, leaks are still dangerous. To detect and manage propane leaks, you should be armed with basic knowledge of what to do when you suspect an issue with propane flowing inside the home. Propane leaks may occur inside a home due to malfunctioning appliances, breaks in lines connecting appliances to the fuel source or connectors that are in poor condition. For propane to fuel appliances inside the home, it is piped to appliances from a tank that is located on the exterior of the home. 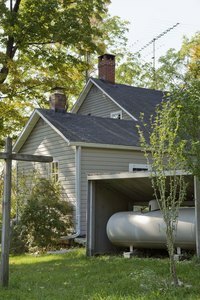 When the pressure inside the propane tank rises above normal levels, it may cause problems along the lines to the interior of the home and result in leaks. Likewise, propane appliances may become worn over time or begin to malfunction and lose their ability to control the release of propane. Propane has a unique, pungent odor similar to that of rotting eggs. This smell typically makes leaks easy to detect, and you should be sensitive to any unfamiliar smell in a home where propane appliances are present. Due to the weight of propane, the smell may be heaviest near the ground. Although the smell is normally detectable by nose, propane leak detectors are available and will sound when the gas is detected in a home. Beyond smell, propane appliances that continually fail to light on their own may signify a leak inside of the home. If you're experiencing signs of carbon monoxide poisoning, such as nausea, dizziness or fatigue for no known reason, you should be wary of a possible propane leak and evacuate the premises immediately. To avoid potential carbon monoxide poisoning, or the trigger of an explosion due to a propane leak, if you suspect a leak, you should contact your propane company and evacuate the home immediately. Do not attempt to turn on any appliances, or turn lights on or off. Avoid introducing sparks to the environment, such as matches, and turn off the propane supply to the home at the exterior tank. Only qualified technicians should test for leaks, and so you should avoid tampering with propane lines or connections to reduce the risk of injury. Propane tanks are often thought to emit a smell of propane when the tank is near empty. This idea leads some people to believe that the scent of propane may simply be a sign that it is time to have the tank filled. However, even empty tanks should not produce more than a faint, brief odor of propane in the home. Regardless of the amount of propane in your tank, noticing the odor of propane in the home is reason enough to call for a technician to investigate the source of the smell. Is It Dangerous for a Hot Water Heater Pilot Light to Go Out? How do I Install Propane Outside of the House to Run a Fireplace?